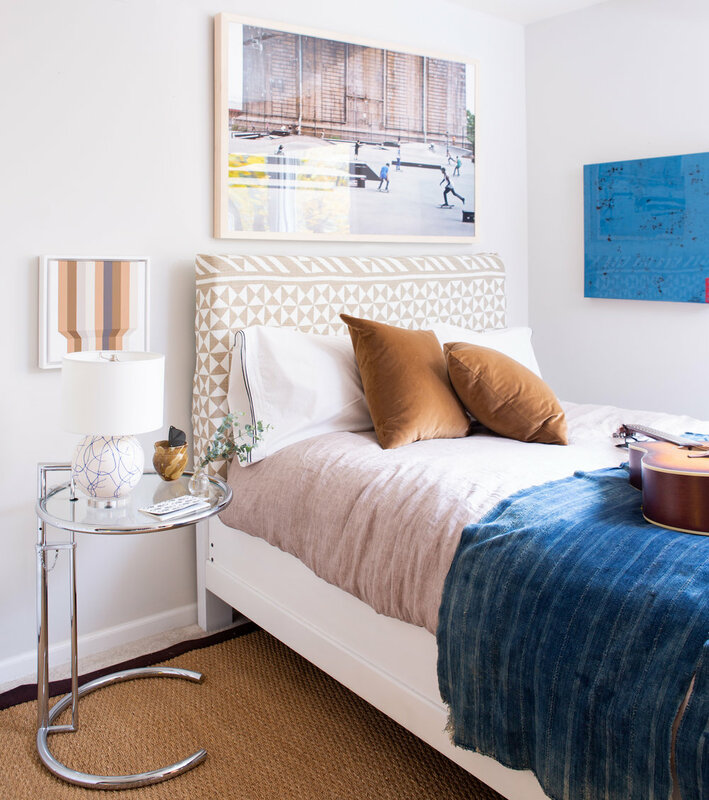 If you missed the guest room reveal last week, you can view it here. 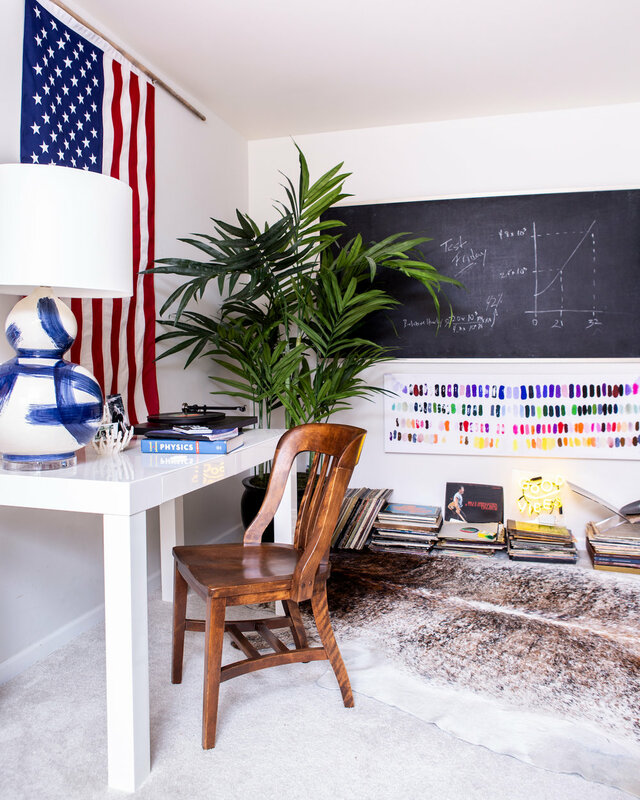 Zeb (my other stepson) was visiting from college last weekend and reported he dug the room’s vibe, and that the eucalyptus garland made it smell like California. Compliments from my stepsons are the best as they’re the hardest earned and indeed earnest! His palm headboard was quite fun but on the youthful side for a 17 yr old. Reupholstering it in Schumacher’s Nuba fabric was the perfect solve. There’s so much movement in the pattern, it’s energetic yet sophisticated, and luxuriously thick. Now it’s a bed he can take with him to college. Both of our sons love to skateboard & I was thrilled to find this skateboard park scene captured on Artfully Walls. It layers in the street vibe, and is the perfect piece to tie together the loose theme of the room. I choose our mini blue scribble lamp for the nightstand to highlight the blue in the skater’s shirt. I love the small scale of the lamp in this space too. The fun op-art is by my talented friend, Gina Julian. I’ve also always adored the spirit of Kristi Kohut’s pieces. I knew her “Leave a Big Mark” would add the color and energy the space needed to feel authentically cool. I already know it will be making appearances throughout our home. I don’t love the carpet but wasn’t up for replacing it just yet. A flea market cowhide rug, layered over a sisal we had in storage, hits the right balance for this relaxed space. I’m so happy with how the spaces came together that they’ve actually inspired me to refresh our master bedroom! I know it will be small tweaks but I’m already excitedly planning! I hope you’ll stay tuned, and you can always follow along with my scheming on Instagram and Pinterest!